With Baselworld 2016 within reach, it’s always a bit of a mind game to ponder what might be in store from some of the more highly anticipated brands in attendance. Rolex, being one of those highly anticipated brands, debuted some widely talked-about models last year, and if the past can foreshadow the future, Baselworld 2016 will be a winner as well. Here’s a brief look at last year’s new products. The Oyster Perpetual Day-Date 40, a highlight for many last year, was shown with a 40mm case and a new mechanical movement—caliber 3255, backed by fourteen patents insuring greater accuracy and resistance to shocks and magnetism, a longer power reserve, and greater ease of use and reliability. The Oyster Perpetual Day-Date was introduced last year in 950 platinum and in 18-karat white, yellow or Everose gold, with a variety of new dial options. 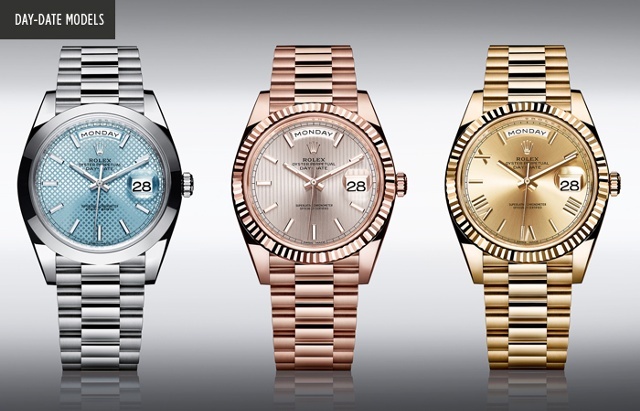 As you know, Everose gold, which Rolex makes in its own foundry, is an alloy containing gold, copper, and a bit of platinum that gives it its unique appearance and properties. And another icon—the Datejust Pearlmaster—welcomed a new size/material combo in a jewelry-style version: 39mm in yellow or white gold with colored baguette-cut sapphires decorating the bezels. Three palettes were introduced for the Pearlmaster, each with a gradation of color that ranges from blue to fuchsia pink, blue to green, and orange to yellow. A new Yacht-Master in two sizes—40mm and a new 37mm—came on the scene in 18-karat Everose gold. Each displays a rotating bezel fitted with a new matte black Cerachrom insert with polished raised numerals. The patented and quite complex rubber Oysterflex bracelet employs a metal framework with a black elastomer overlay. The Yacht-Master strap (Rolex calls it a bracelet) is ridged for stability. In my opinion, this is truly a great looking and thoughtfully conceived timepiece that proves that collections can continue to evolve and inspire. 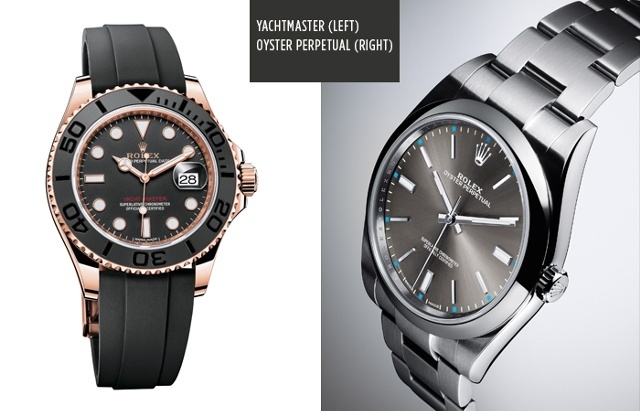 How will a new Yacht-Master differ in 2016? 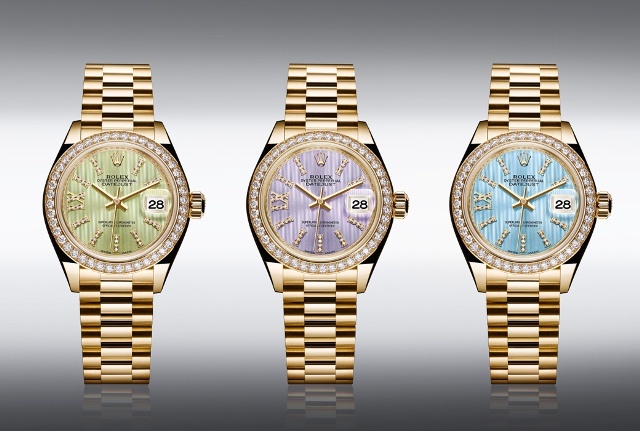 Finally the 39mm Rolex Cellini Time embraced four new gem-set versions in 18-karat white or Everose gold. One style features a single row of diamonds on the bezel, while another offers a double décor, combining a row of diamonds with Rolex fluting. The single-row versions are offered with new pink or rhodium dials with a sunray finish and applied hour markers, while the double décor has a black lacquer dial alight with 11 diamonds complementing the hour markers. 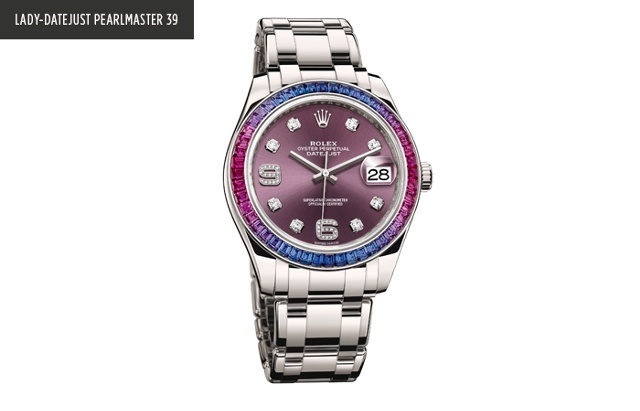 The bezel of the former version features 62 diamonds, while the latter features 96. 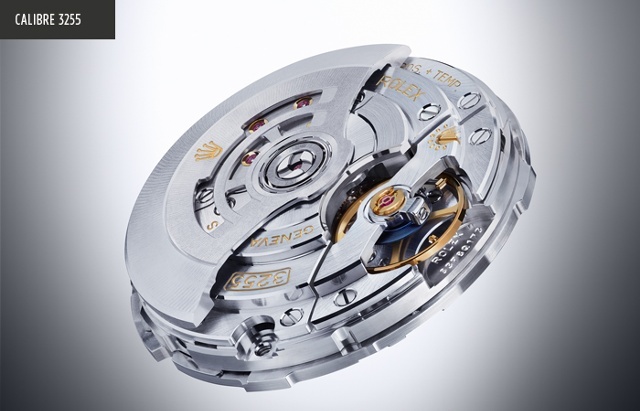 Inside each is a self-winding movement with about 48 hours of power reserve.